I had the privilege of presenting at GITEX Dubai. The event organizer asked me to speak on ‘The Risks and Rewards of SaaS CRM’. For some background, Software as a Service (SaaS) and cloud computing have not yet penetrated the Middle East software market as they have in the U.S., Western Europe and Southeast Asia. This early infancy market perspective found in the Middle East offers a refreshing opportunity to speak about the tangible and measurable business benefits of SaaS, and stay clear of the more esoteric discussions such as multi-tenant architectures, IT delivery platforms and other arguments levied by the SaaS purists. Downtime and SLAs. When SaaS Customer Relationship Management (CRM) systems were initially débuted at the turn of the century they were met with reservations about uptime and security. On-demand CRM vendors responded to system uptime and uninterrupted availability by showcasing their data centers, and more specifically, their hardware and telecom redundancy, high availability (HA) and immediate fail-over capabilities. System downtime renders a business software application worthless — and can stop a business in its tracks. Sure, short and infrequent CRM system outages aren’t as critical as accounting software or ERP software downtime; nonetheless, when sales people aren’t selling it has a negative cascading effect throughout the business. Mitigation strategy: To avert SaaS CRM downtime, pursue a three step verification process. First vet your vendor’s data center redundancy. They should be able share documentation which supports N+1 redundancy and no single point of failure. Most vendors also welcome data center tours for first hand viewing. Also, they should have more than one data center. Any SaaS vendor which only operates a single data center is putting your application availability at risk. Second, review the vendors downtime history. Some vendors such as Salesforce.com display their uptime online (although only for the last 30 days). Getting a schedule of all downtime interruptions for at least the last two years will provide a strong gauge in predicting future uptime. Third, review the Service Level Agreement (SLA). Understand whether the vendor excludes ‘planned maintenance’ from downtime calculations and make certain the SLA provides financial compensation if target uptime metrics are not met. It can also be helpful to translate the vendors SLA uptime guarantee into a real time equivalent. For example, a 99.95% SLA means 4.5 hours of downtime per year is acceptable. Information Security. CRM systems normally contain a company’s two most important information assets – their customer list and their sales forecast. Ensuring information security around these assets is paramount. A compromise in information security can lead to customer ill will, a public relations nightmare and regulatory fines from governments which impose strict privacy laws for consumer data. Mitigation strategy: Ensure your SaaS vendor has a mature information security plan, backed with risk analysis, business continuity & disaster recovery methods, layered security protocols and a capable information security team. Leading on-demand CRM vendors get third party information security audits and offer independent attestations such as the ISO 27001. System Integration. CRM systems are often departmental applications that must be integrated with back office accounting applications, ERP systems, custom billing programs or other legacy environments. A failure to integrate business information systems across the enterprise results in an increase of manual processes, manual data entry, data inaccuracies that accompany transposition errors, transaction cycle times and multiple data repositories. It can also make getting reports a challenging process. Mitigation strategy: Several SaaS vendors offer tools to perform standards-based system integration. Some vendors deliver a WSDL (web services description language) file for describing web services, online data dictionary and packaged XML web services for fairly straight forward integration. Other vendors partner with ETL (Extract Transform Load) vendors or the new breed of Integration as a Service (IaaS) solutions from vendors such as Cast Iron, Boomi or Pervasive which have created many templates and pre-packaged integrations between all sorts of systems. Software Customization. The initial release of on-demand CRM systems lacked the years of maturity built into the prior era of client/server systems as well as the methods to customize the systems to meet atypical business processes or unique requirements. Missing CRM software functionality, which cannot be remedied via software customization or another method, generally results in manual efforts, thereby driving up labor costs, driving down user productivity and challenging user adoption. Mitigation strategy: Leading SaaS CRM solutions have adapted their shared applications with customization tools, often in the form of Platform as a Service (PaaS) add-on products. PaaS tools generally permit customization as a layer of abstraction between the core CRM system and the presentation layer, thereby not changing source code or the original product and easing the way for continued upgrades. Open source CRM vendors such as SugarCRM take a different approach and simply offer source code to their customers. 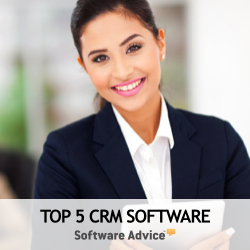 A third option is for customers to seek pre-integrated applications among the eco-systems which surround popular CRM vendors such as Salesforce.com’s AppExchange, NetSuite’s SuiteApps directory or Microsoft’s Dynamics CRM partner network. Another consideration is to purchase suite-based applications which deliver fully integrated broad applications for use across the enterprise. For example, both NetSuite and SAP’s Business ByDesign offer an integrated business system which includes CRM, accounting software, distribution software, manufacturing systems and HR/payroll applications. Total Cost of Ownership (TCO). While predictable expenses and a usage based pricing model are welcome news in the enterprise software industry, SaaS CRM systems which break the bank don’t deliver ROI for customers. Mitigation strategy: To evaluate this risk, you will have to construct a multiple year cash projection and TCO model. SaaS costs are simple and predictable. On-premise software will require key assumptions such as variable costs, internal rate of return and the useful life of the system. Most CFO’s suggest that a business applications useful life is 5 years, although that figure is clearly declining every year as the cost of business systems fall while their utility rises. Focusing on risks and rewards which deliver bottom line business impact, and not getting sidetracked into the nebulous techno jargon, will aid business and IT buyers in determining whether SaaS CRM software systems make the best business sense for their organisations. You missed one of the biggest benefits of software as a service which is achieving variable costs. This turned out to be a significant factor in getting our saas crm project approved. Variable costs are very appealing to many businesses, and their CFO's. During the 2008/9 recession many businesses trying to cut expenses found themselves stuck with fixed cost software licenses and annual maintenance agreements. However, looking at the other side of the coin may suggest that during growth periods fixed cost IT assets can actually deliver greater leverage and cost-benefit return. Data security remains an issue at our company. Our IT Director refuses to permit saas and I'm unsure if security is a valid reason or just an excuse to maintain control. Are saas systems less secure than in house? It depends on the SaaS provider and your particular in-house operation. However, for many SaaS adopters information security is increased. Many small and midsize businesses (SMBs) as well as larger companies are under-resourced in the IT department and even more don't have dedicated and expert information security staffing. Information security is a core competency backed with advanced tools and staffed with seasoned experts at many of the leading SaaS CRM vendors. Most SMBs cannot match the information security investment and commitment required of top SaaS providers. When will software as a service be ready for larger businesses? It already is. An IDC report shared that 28% of all outsourced application engagements are by companies with 5,000+ employees. SaaS CRM vendor Salesforce.com has referenced many SaaS customers in excess of 10,000 seats each. Isn't software as service best suited for small companies with few or no IT staff? While SaaS CRM or other on-demand business software systems may be very helpful to SMB companies with few or no IT staff, I believe the remote delivery of hosted business applications is just as helpful to organizations with larger IT departments which seek to free up IT resources for more strategic projects. I like cloud sales force automation systems, however, I don't think the rest of crm is ready for prime time. Perhaps. However, on-demand CRM systems have evolved from the early days of basic contact management and simple sale force automation to include sophisticated marketing automation, customer support, partner relationship management (PRM), customer analytics, mobile CRM and even social CRM. For the most part, on-demand CRM systems have matured to include feature sets, functionality, depth and scalability of the prior era client/server and on-premise systems. I agree with your prior comment, however, I don't think ondemand business systems have advanced very far within vertical markets. Companies in different industries have different requirements for tracking opportunities, forecasting sales and growing customer relationships. Vertical market business software systems typically evolve with time. If you look back to mainframe systems, then host-based mid-range systems, and then client/server business systems, each business systems platform evolution began with horizontal applications and then with time delivered industry specific solutions. We're now seeing this platform evolution repeat with SaaS CRM systems. Salesforce.com has built a financial service edition. RightNow has a strong Government and public sector CRM product. NetSuite, with its acquisition of OpenAir, has a strong professional services solution and Oracle On Demand has targeted several vertical markets. Not all industries are served with SaaS CRM systems, but over time many more vertically focused solutions are certain to hit the market. Within the context of CRM systems, customer analytics are normally part of a business intelligence (BI) reporting suite. While each vendor solution varies, BI suites may include dashboards, data warehousing and online analytical processing (OLAP). CRM software systems now routinely deliver pre-built dashboards with metrics (often called Key Performance Indicators) and data warehouses (often called cubes). BI seeks to aggregate data and make it available in visual ways in order to help decision makers flex the data, learn from the information and make better decisions. BI usage is a best practice that helps companies unlock the value of customer data that most companies have, but few capitalize on. CRM software normally contains a company’s two most important information assets – their customer list and their sales forecast. Ensuring security around these assets is paramount. A compromise in security can lead to customer ill will, a public relations nightmare and regulatory fines from governments which impose strict privacy laws for consumer data."